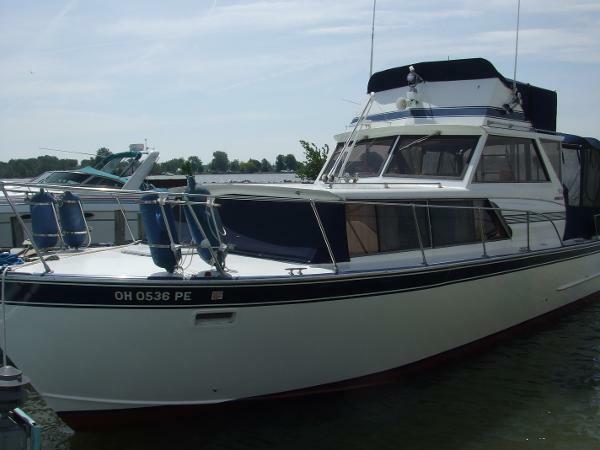 1989 Egg Harbor 37 Convertible This is a well found and cared for classic Egg Harbor 37 Convertible with MANY updates. Second owner. Freshwater only boat. The 37's wide beam provides an interior volume seldom found on boats of her size making her salon the highlight of this model. Multi year refit including: Newer Westerbeke Genset (2000), New carpet, drapes, reupholstered furniture, blinds, and interior lighting (2011-2012), New Teleflex controls (2011), All deck hardware removed re-plated and rebedded (2011), All new exterior teak (2011) refinished with 10 coats Petit Captains Varnish (2017), Under platform swim ladder (2012), New VacuFlush toilet and holding tank / hoses as well as teak flooring and new wall paper in head (2012), New Stamoid vinyl Bimini and four sided Strataglass flybridge enclosure (2012), New HD TV/DVD and Bluetooth stereo with customized mount and teak cabinet (2014), New microwave oven (2014), Salon windows removed, powder coated, and re-bedded (2014), Upgraded Garmin electronics with touchscreen GPS chartplotter and AIS equipped VHF (2014), New dual voltage refrigerator / freezer (2014), New smart battery charger (2014), New water heater and pressure water pump (2015), New salon AC with reverse cycle heat, sound shield, additional vent in salon, and circulation pump (2015), New accent stripes on flybridge and hull (2016), Dripless shaft seals (2017), New exterior Infinity carpeting (2017), exterior teak refinished (2017) Owner moving up to 3 cabin boat. 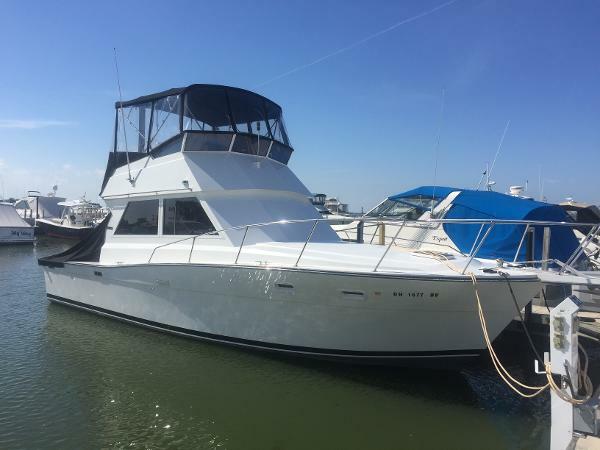 2001 Sea Ray 560 2001 Sea Ray 560 DB CAT Engines (2) at 800HP each Port - 990 hours Starboard - 989 hours Generator 1,598 hours Navigation: Raymarine E 120 Radar: Raytheon Pathfinder Raytheon Auto Pilot ST 7000+ Raytheon Tridata ST60 Radio: Raymarine Ray 218 Furuno Fish Finder Boat is in incredible condition and includes a lot of custom upgrades including: -Custom Teak wood chairs -Bow. -Custom Teak wood dining table(with slide-in grill) -Aft. -Upgraded flat screen TVs throughout. -Fully upholstered custom interior dash area. 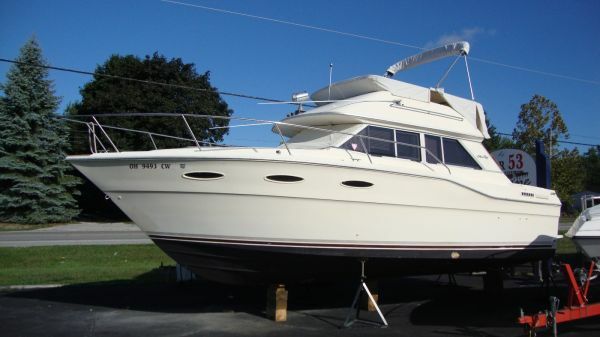 1985 Sea Ray 300 Sedan Bridge Price Reduced For Quick Sale! Up-Graded Sea Ray Classic! Spacious 30' sedan bridge with many updates. Less that 500 Hours on Engine! 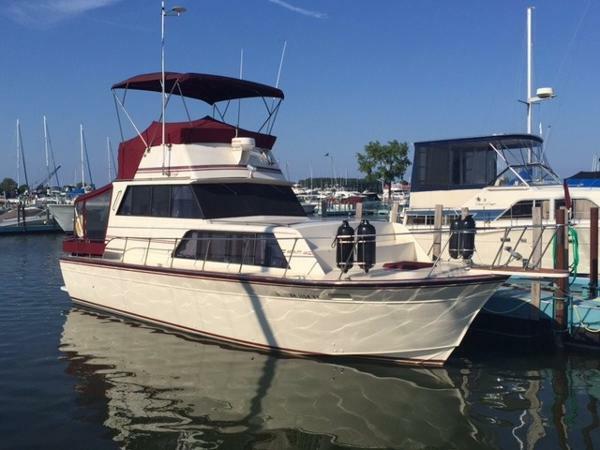 This upgraded and well-kept water ready boat was dry stored, with plenty of extras to include: 30”trim tabs Bennent, new commode power flush, ship to shore radio and high end GPS and hailer, new upholstery, new curtains and carpet, new stereo 10 speakers, dripless ceramic shaft packing, central air and separate furnace, new hot water tank, upgraded rotary fresh water pump, camper cover on rear with windows, 1 flat screen TV wired for Direct TV, three battery with bank new charger, newer teak pulpit, solid stainless anchor and holder. Sleeps 6 and room for 5 on the Fly bridge is fun for all. 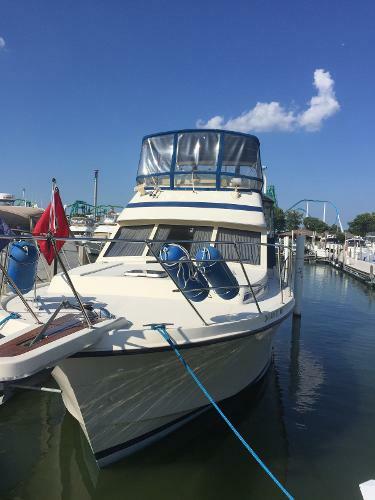 1990 Carver 32 Mariner Lots of upgrades that include but not limited to; New 2014 Refrigerator, All newer Canvas, New Custom Mooring Cover, Curtains, Smart Charger and Smart TV. This has been a fresh water boat all its life. 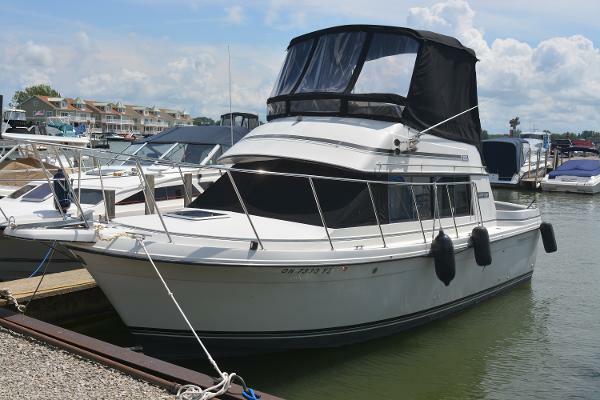 1988 Carver 28 Mariner This Carver has had only TWO owners and she is Turn Key Ready!! 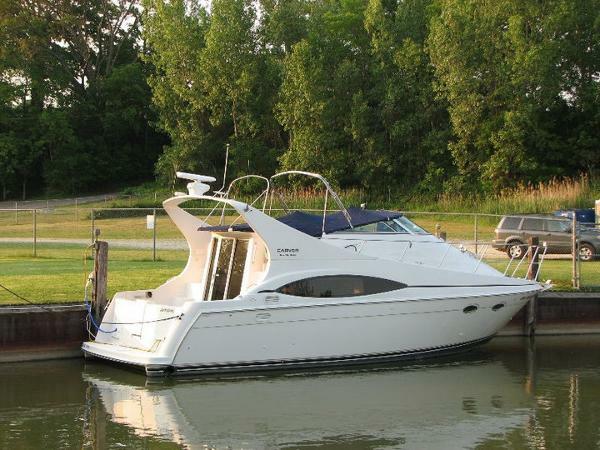 Equipped with twin 5.0 Blue Water Inboard Mercrusiers with only 932 hours. 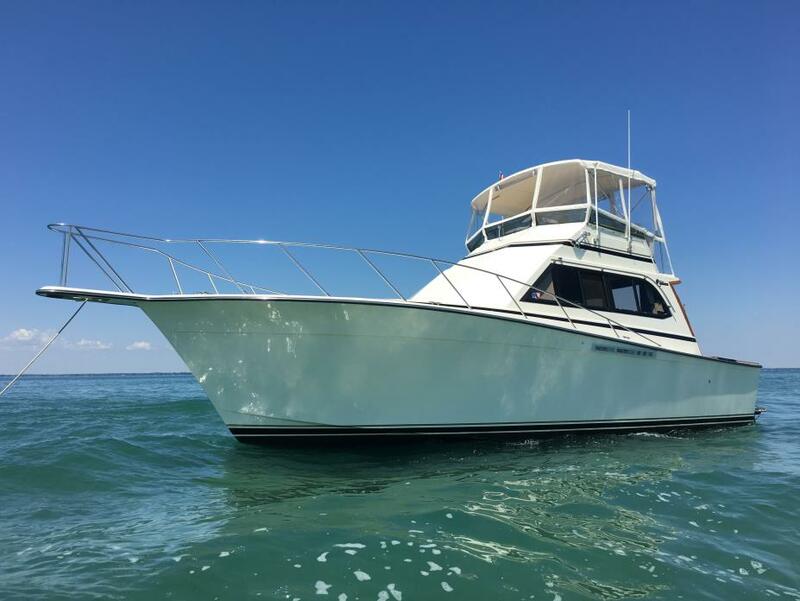 Over the past year the boat has had new bottom paint (old was stripped off), new canvas enclosure, upgraded entertainment system with a flat screen TV in the cabin. 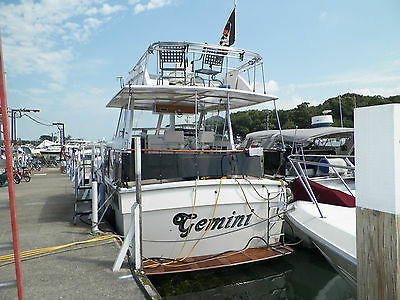 Everything is included with the boat like lines, fenders, portable AC unit, power cords and many more. The dock is included with the purchase of the boat for the remaining of the 2016 season. Call TODAY for more information on this Beauty! Photo Viewer 2008 Carver Boats 43 SS VIEW OTHER AUCTIONS ASK SELLER QUESTION Vital Information Year Make Model Mileage Engine 2008 Carver Boats 43 SS 400 Exterior Interior Stock# VIN White #CARVER CDRW2058E708 view window sticker Photos Description 2008 Carver Boats 43 SS 500 BROADWAY AVE. BEDFORD, OH 44146 FOR ALL INFO ON THIS VEHICLE CALL OUR EBAY TEAM 877-946-9220 Auto World USA INC. is proud to present to you this 2008 Carver Boats 43 SS with only 400 documented Hours. 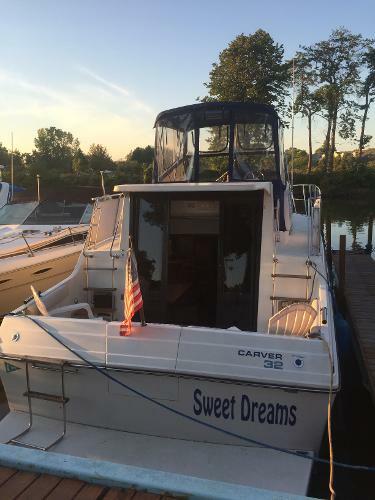 This fine vehicle is equipped with (but not limited to): 2008 43 CARVER SSFresh Water This spacious 2 full stateroom 2 bath boat is perfect for a family. You can relax in the open galley or hide away from the kids in the air conditioned fly bridge. 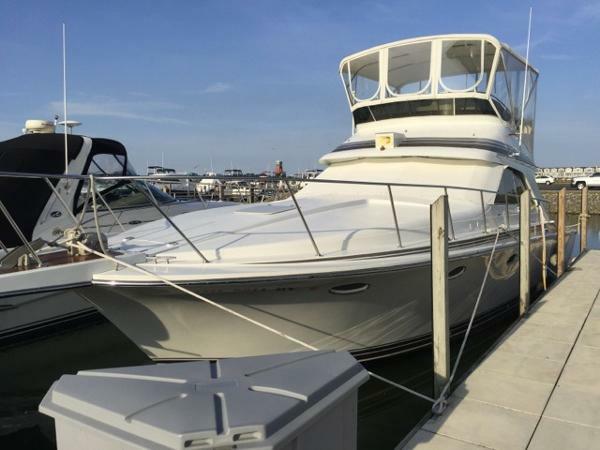 This boat has been meticulously detailed including two wax jobs a year. Many upgrades this past year including 4 new HD Tv's (2 smart Tv's), trac vision,and new underwater lights. This boat has all the bells and whistles IPS Joystick and a back up camera to teach the first mate to dock. All maintenance has been done yearly at Skipper Buds had oil change and all fluids changed, all new belts and pullies replaced this year. This big girl's IPS 600 diesels cruise at 30mph burning 22 gph. Let the big dogs race you to the gas dock...you will still come out ahead. WASHER AND DRYER,KOHLER 10KW GENERATOR FULL ENCLOSURE, E80 COCKPIT ICEMAKER AND SINK,LARGE SWIM PLATFORM,LIKE NEW! !400hrs WANT TO KNOW THE RESERVE? OR EVEN BUY IT NOW? CALL OUR EBAY TEAM @ 877-946-9220. We’ll be happy to answer questions, end the auction early or add a buy it now for you. Want to schedule a full vehicle walkaround over the phone? Call now! We are happy to offer FREE CARFAX and Autocheck reports for ALL of our vehicles upon request. 877-946-9220 CALL NOW! We can assist with shipping your vehicle to a port for overseas export, or to a domestic border crossing for Canadian import. We can have your title and paperwork sent to the border before your vehicle even arrives! We are located at 500 Broadway Ave in Bedford, Ohio just 20 minutes east of Cleveland Hopkins International Airport. We offer FREE airport, bus terminal and train station pick up as a courtesy. Ask about our money back satisfaction guarantee! Call now for details and talk to us. 877-946-9220 CALL NOW! Auto World USA Inc. would like to thank you for the opportunity to earn your business! We are a fully functional/operational dealership with over 200 vehicles in stock. You are NOT buying a vehicle from a corner lot dealer with a tiny inventory. If this particular vehicle isn't exactly what you are looking for, maybe we have something to better suit your needs. Just ask about our full vehicle inventory! http://www.autoworldusainc.com/web/videos Our vehicles are from NE Ohio and as we all know pictures can be deceiving. Though it is not mandatory we encourage all clientele to have your vehicle of interest inspected by a qualified 3rd party mechanic prior to purchase. We ask this because of the great variance of opinion from individual to individual and Auto World will not be held accountable for any difference between expectation and reality. Our photos are taken by an outsourced company (Photo Finish) and are not edited; they are of the actual vehicle. Please feel free to contact our ebay team @ 877-946-9220 to discuss this vehicle. We offer a 1 on 1 walk around of any of our vehicles during business hours (i.e. video, chat and/or cell) this separates us from other dealers. Do you have an iPhone? Set up an appointment for a FACETIME VIDEO CHAT so you can see the car live! We earn your trust then we earn your business. Not the other way around! We sell our vehicles AS IS because of our low profit margins. However, we do have insured national warranties available to protect your investment. Please ask us for pricing on GUARDIAN WARRANTY CO. warranties, it would be our pleasure to offer you another great value. They are some of the best in the business, offering fantastic value. Great prices, excellent coverage, and zero deductible available, just ask! Rest assured that whether or not this is your first buying experience online, you will receive the utmost respect and courtesy you deserve. Call now to see why we have 100% positive, perfect feedback from our satisfied customers! We understand buying a car online can be stressful and sellers can be deceptive. You deserve to be informed and we are here to offer you as much information as you request to make your buying experience smooth and easy. REST ASSURED THAT YOUR ONLINE CAR BUYING EXPERIENCE WILL BE AS STRESS-FREE AS POSSIBLE. FEEL FREE TO CALL US AT 877-946-9220 IF YOU HAVE ANY QUESTIONS! PLEASE READ BEFORE BIDDING AS IS - NO WARRANTY This vehicle is being sold as is, there is with no warranty, expressed, written or implied. The seller shall not be responsible for the correct description, authenticity, genuineness, or defects herein, and makes no warranty in connection therewith. No allowance or set aside will be made on account of any incorrectness, imperfection, defect or damage. Any descriptions or representations are for identification purposes only and are not to be construed as a warranty of any type. It is the responsibility of the buyer to have thoroughly inspected the vehicle, and to have satisfied himself or herself as to the condition and value and to bid based upon that judgment solely. The seller shall and will make every reasonable effort to disclose any known defects associated with this vehicle at the buyer's request prior to the close of sale. Seller assumes no responsibility for any repairs regardless of any oral statements about the vehicle. This transaction takes place at my location in Ohio. Any dispute resolution, arbitration, mediation and/or litigation shall take place in Bedford, Ohio. Buyer agrees that sole jurisdiction rests within the County of Cuyahoga, State of Ohio. All vehicles go through a basic inspection in our service facility, please contact us for details. Auto World USA is a wholesale outlet and because of varying degrees of opinions we do not express or imply any type of overall condition, fitness or performance of any vehicle we sell. Because of test drives and employee demonstrators, mileage online can vary greatly from actual mileage. Please ask your sales associate to verify mileage for you, it would be our pleasure. We encourage you to have your vehicle of interest inspected by a 3rd party service facility prior to purchase. Auto World USA will not be liable for any lot damage or acts of God regarding any vehicle that is not picked up for immediate delivery after purchase. Need a recommendation for a third-party inspection facility? Just ask. We are happy to provide you with the names of area companies who provide these services at a reasonable and minimal cost. Information deemed reliable, but not guaranteed. Interested parties should confirm all data before relying on it to make a purchase decision. All prices and specifications are subject to change without notice. Prices may not include additional fees such as government fees and taxes, title and registration fees, finance charges, dealer document preparation fees, processing fees, and emission testing and compliance charges. Internet special price may not be compatible with dealer sponsored or subsidized subprime financing. Please feel free to contact us at 877-946-9220. We are happy to do a full vehicle walk-around with you as well as send additional photos or video. Our auctions rarely last for the duration. These vehicles sell locally, or sell to lucky eBay buyers who recognize our fantastic values before someone beats them to it! We end auctions early and have many deposit and payment options. Thanks for viewing! 877-946-9220 CALL NOW! WANT TO KNOW THE RESERVE? OR EVEN BUY IT NOW? CALL OUR EBAY TEAM @ 877-946-9220. We’ll be happy to answer questions, end the auction early or add a buy it now for you. Want to schedule a full vehicle walkaround over the phone? Call now! We are happy to offer FREE CARFAX and Autocheck reports for ALL of our vehicles upon request. 877-946-9220 CALL NOW! We can assist with shipping your vehicle to a port for overseas export, or to a domestic border crossing for Canadian import. We can have your title and paperwork sent to the border before your vehicle even arrives! We are located at 500 Broadway Ave in Bedford, Ohio just 20 minutes east of Cleveland Hopkins International Airport. We offer FREE airport, bus terminal and train station pick up as a courtesy. Ask about our money back satisfaction guarantee! Call now for details and talk to us. 877-946-9220 CALL NOW! Auto World USA Inc. would like to thank you for the opportunity to earn your business! We are a fully functional/operational dealership with over 200 vehicles in stock. You are NOT buying a vehicle from a corner lot dealer with a tiny inventory. If this particular vehicle isn't exactly what you are looking for, maybe we have something to better suit your needs. Just ask about our full vehicle inventory! http://www.autoworldusainc.com/web/videos Our vehicles are from NE Ohio and as we all know pictures can be deceiving. Though it is not mandatory we encourage all clientele to have your vehicle of interest inspected by a qualified 3rd party mechanic prior to purchase. We ask this because of the great variance of opinion from individual to individual and Auto World will not be held accountable for any difference between expectation and reality. Our photos are taken by an outsourced company (Photo Finish) and are not edited; they are of the actual vehicle. Please feel free to contact our ebay team @ 877-946-9220 to discuss this vehicle. We offer a 1 on 1 walk around of any of our vehicles during business hours (i.e. video, chat and/or cell) this separates us from other dealers. Do you have an iPhone? Set up an appointment for a FACETIME VIDEO CHAT so you can see the car live! We earn your trust then we earn your business. Not the other way around! We sell our vehicles AS IS because of our low profit margins. However, we do have insured national warranties available to protect your investment. Please ask us for pricing on GUARDIAN WARRANTY CO. warranties, it would be our pleasure to offer you another great value. They are some of the best in the business, offering fantastic value. Great prices, excellent coverage, and zero deductible available, just ask! Rest assured that whether or not this is your first buying experience online, you will receive the utmost respect and courtesy you deserve. Call now to see why we have 100% positive, perfect feedback from our satisfied customers! We understand buying a car online can be stressful and sellers can be deceptive. You deserve to be informed and we are here to offer you as much information as you request to make your buying experience smooth and easy. REST ASSURED THAT YOUR ONLINE CAR BUYING EXPERIENCE WILL BE AS STRESS-FREE AS POSSIBLE. FEEL FREE TO CALL US AT 877-946-9220 IF YOU HAVE ANY QUESTIONS! PLEASE READ BEFORE BIDDING AS IS - NO WARRANTY This vehicle is being sold as is, there is with no warranty, expressed, written or implied. The seller shall not be responsible for the correct description, authenticity, genuineness, or defects herein, and makes no warranty in connection therewith. No allowance or set aside will be made on account of any incorrectness, imperfection, defect or damage. Any descriptions or representations are for identification purposes only and are not to be construed as a warranty of any type. It is the responsibility of the buyer to have thoroughly inspected the vehicle, and to have satisfied himself or herself as to the condition and value and to bid based upon that judgment solely. The seller shall and will make every reasonable effort to disclose any known defects associated with this vehicle at the buyer's request prior to the close of sale. Seller assumes no responsibility for any repairs regardless of any oral statements about the vehicle. This transaction takes place at my location in Ohio. Any dispute resolution, arbitration, mediation and/or litigation shall take place in Bedford, Ohio. Buyer agrees that sole jurisdiction rests within the County of Cuyahoga, State of Ohio. All vehicles go through a basic inspection in our service facility, please contact us for details. Auto World USA is a wholesale outlet and because of varying degrees of opinions we do not express or imply any type of overall condition, fitness or performance of any vehicle we sell. Because of test drives and employee demonstrators, mileage online can vary greatly from actual mileage. Please ask your sales associate to verify mileage for you, it would be our pleasure. We encourage you to have your vehicle of interest inspected by a 3rd party service facility prior to purchase. Auto World USA will not be liable for any lot damage or acts of God regarding any vehicle that is not picked up for immediate delivery after purchase. Need a recommendation for a third-party inspection facility? Just ask. We are happy to provide you with the names of area companies who provide these services at a reasonable and minimal cost. Information deemed reliable, but not guaranteed. Interested parties should confirm all data before relying on it to make a purchase decision. All prices and specifications are subject to change without notice. Prices may not include additional fees such as government fees and taxes, title and registration fees, finance charges, dealer document preparation fees, processing fees, and emission testing and compliance charges. Internet special price may not be compatible with dealer sponsored or subsidized subprime financing. Please feel free to contact us at 877-946-9220. We are happy to do a full vehicle walk-around with you as well as send additional photos or video. Our auctions rarely last for the duration. These vehicles sell locally, or sell to lucky eBay buyers who recognize our fantastic values before someone beats them to it! We end auctions early and have many deposit and payment options. Thanks for viewing! 877-946-9220 CALL NOW! Contact Us Dealer Contact Auto World USA AutoCheck Auto World USA is a AutoCheck Certified dealer. Please call us for a FREE AutoCheck report for this vehicle. Secure Online Credit Application Applying for a vehicle loan online is one of the quickest and easiest application methods. Our secure online application form is easy to complete, all you need are a few personal and employment details. Get started now. Below are a few of the other vehicles currently available from Auto World USA About Auto World USA Welcome to Auto World USA! Auto World USA is a very high volume used car dealership located at 500 Broadway Ave., in Bedford, Ohio. We concentrate on selling at or very near trade-in value based on "clean" NADA and Black Book vehicle valuation guides. We sell not only to the general public but to other licensed dealerships around the world. Though our specialty is in German, Asian and American high end vehicles, we do carry a wide range of years, makes and models to satisfy our dynamic client base. All vehicles are sold “AS-IS, NO WARRANTY EXPRESSED OR IMPLIED” unless still under factory warranty. Auto World USA has a no return policy. It is sole responsibility of the buyer to have done their due diligence with regard to having any vehicle inspected by a 3rd party individual or service facility prior to purchase to satisfy their own expectation regarding originality, description, fitness, performance and overall condition of any vehicle advertised by Auto World USA. The buyer is responsible for any additional fees to include but not limited too; documentary, tax, title and license fees. Though it is our pleasure to help our clients set up shipping via an insured carrier it too is at the expense of the buyer. Auto World USA is an Ohio licensed/operated business and it is agreed by the purchaser and Auto World USA that any disputes that may arise are to be resolved in the State of Ohio, City of Bedford /Cuyahoga County. Ohio laws shall govern the rights and duties under the terms of sale. Terms and Conditions- Please read prior to bidding/buying Terms And Conditions- Please Read Prior to bidding/buying. Auto World USA, Inc is physically located at 500 Broadway Ave Bedford, Ohio 44146. We are located just 15 minutes from Cleveland Hopkins International Airport. Welcome to Auto World USA! Auto World USA is a very high volume used car dealership located at 500 Broadway Ave., in Bedford, Ohio. We concentrate on selling at or very near trade-in value based on "clean" NADA and Black Book vehicle valuation guides. We sell not only to the general public but to other licensed dealerships around the world. Though our specialty is in German, Asian and American high end vehicles, we do carry a wide range of years, makes and models to satisfy our dynamic client base. All vehicles are sold “AS-IS, NO WARRANTY EXPRESSED OR IMPLIED” unless still under factory warranty. Auto World USA has a no return policy. It is sole responsibility of the buyer to have done their due diligence with regard to having any vehicle inspected by a 3rd party individual or service facility prior to purchase to satisfy their own expectation regarding originality, description, fitness, performance and overall condition of any vehicle advertised by Auto World USA. The buyer is responsible for any additional fees to include but not limited too; documentary, tax, title and license fees. Though it is our pleasure to help our clients set up shipping via an insured carrier it too is at the expense of the buyer. Auto World USA is an Ohio licensed/operated business and it is agreed by the purchaser and Auto World USA that any disputes that may arise are to be resolved in the State of Ohio, City of Bedford /Cuyahoga County. Ohio laws shall govern the rights and duties under the terms of sale. Office Hours: Monday through Saturday 9am - 6pm EST. Upon request we may be able to accommodate an early or later delivery. Please inquire within. Phone Hours: We are an ecommerce dealer. We take phone calls 7 days a week from 8am - 11pm. Please don’t hesitate to call with any questions or concerns within these hours. Odometer Readings: Due to test drives and mechanical inspections, the mileage of the vehicle represented can differ from the mileage stated when the vehicle was first listed on eBay. Our staff is entitled to take any vehicle they like as a demo to get to know the product they are representing better. Bidding: Your bid constitutes a legally binding contract to purchase this vehicle. Please do not bid if you're not seriously interested or financially able to purchase this vehicle. Please read eBay's "User Agreement". Bidder's Age: You must be 18 years of age or older to bid. Bid Retraction: Please read eBay's "Retracting a Bid". If you place a bid before the last 12-hour period of the auction, you may retract the bid before the last 12-hour period only for exceptional circumstances. You will not be allowed to retract that bid during the last 12-hour period of the auction. If you place a bid during the last 12-hour period of the auction, you will be allowed to retract the bid for exceptional circumstances only if you do so within one hour after placing the bid. Financing: For help in arranging financing or for any questions regarding financing options, please contact us prior to bidding/buying. Not being able to arrange financing does not constitute a valid reason for deposit refund. So, be sure financing is in order or approved before placing a deposit on any car. Buyer's Inspection: We do our best to disclose all information known about this vehicle for auction. We also offer multiple choices in receiving full disclosure of the vehicle your viewing prior to purchase. We welcome a Buyer's Inspection. If you plan to have a Buyer's Inspection, please make sure you have the vehicle inspected prior to the end of the auction. Inspection fees, if any, are the "Buyer's" sole responsibility. Warranty: Unless stated otherwise, this vehicle is being sold "as is". Manufacturer's warranties may still apply. An extended warranty may also be available. Please contact us for details. No representations or warranties are made by the "Seller", nor are any representations or warranties relied upon by "Bidders" in making bids. The vehicle you are purchasing is a “used” machine. Even with all of our pre-emptive measures such as inspections, test drives and services we cannot for see what, if any, mechanical malfunctions may occur in a year, a month or even a week. It is strongly suggested but is not mandatory that you purchase and extended warranty to protect your investment. Payments: A deposit of $500.00 by credit card, PayPal or cash in person (non-refundable) must be paid within 24 hours of the close of the Auction. The remaining balance must be paid within 7 days. Ohio is a title holding state and can take up to 21 business days to release a title. If you have a need for the title work to be completed and received by you quicker than 21 business days please contact your sales representative and request a quicker turn around. We will do our very best to accommodate this request however there can be no guarantee’s made as it is case by case sensitive. We issue a 30 day temporary tag at the time of sale so that you may drive your vehicle while you await title transfer work to be completed by the state of Ohio. Taxes and Fees: "Buyer" is responsible not only for knowing their own states' laws regarding taxes and fees, but also remitting the proper taxes, fees, and documents for their state. All taxes and fees must be paid in full in order for the vehicle to be titled and registered. All sales will be subject to pay a $283.50 Admin which includes all paperwork, titling, temporary tag, temporary registration, notary and overnight mailing costs. Title Information: Vehicle titles may be held by banks or lenders as collateral for loans. In many cases there is a delay in receiving the original instruments of up to 21 days from the time we pay a vehicle off. While we usually have all titles in our possession at closing, there are occasions where we may be waiting for them to arrive. Finalizing Your Purchase: Winning bidder MUST communicate with us by e-mail or phone within 24 hours of the end of the auction to make arrangements to complete the transaction. If we cannot confirm your intention to buy or the sale is not completed within 24 days, we reserve the right to re-list this vehicle or sell to any other qualified buyer. Before the vehicle is released for shipment to the "Buyer", all sale-related and title-related paperwork must be signed and returned completed to the "Seller". Shipping and Delivery: All shipping charges are the "Buyer's" responsibility. We will help with shipping arrangements but will not be responsible in any way for claims arising from shipping damage! Licensed "Carriers" are generally insured for $500,000. We assume no responsibility for damages incurred after the vehicle leaves our showroom. All shipping arrangements provided by us are strictly a courtesy. We are not affiliated with any carrier. Any claims or other communication regarding shipment of vehicles will be between you and the "Carrier" and not with us. The amount of time it takes for delivery depends upon the "Carrier" selected. A typical experience is 7-14 days from the date the vehicle is picked up from our facility until it is delivered to your destination. Auto World USA, Inc shall not be held liable for shipping delays caused by transporter cancelations, mechanical issues on the transport vehicle, weather, traffic and any/all reasons for which a vehicle pick up/delivery fault is caused. Verify with the "Carrier" for an Estimated Time of Arrival to be sure. Auto World USA, Inc reserves the right to obtain and verify the registered information of all users who bid on this auction, cancel any and all bids at our discretion, or end the auction early if necessary. ****These vehicles are USED vehicles and are not new. Please expect a certain amount of wear, use, and flaws, as is standard on ANY used car. All used cars including this one may have dings, nicks, chips, scratches and any other marks that are associated with use consistent with age and mileage of the vehicle. Obviously, a car that is 10 years old will show more wear and have more flaws than one that is 2 years old. While we try to service any known defects it is still possible for used vehicles to need service or repairs the first days or weeks of ownership. NOT likely, but possible! Since these vehicles are used, please remember that books, extra keys, remote entry keys, floormats, CD cartridges, etc..., do not always remain with vehicles throughout their life. We will not be responsible for these minor accessories. These items are all replaceable at any local factory dealer or right here on eBay for a few dollars. We strongly recommend that all buyers purchase the optional extended warranty. This will help defray the cost of mechanical repairs, if any, in the future*** The information, products, and services published on this web site may include inaccuracies or typographical errors. Auto World USA, Inc and/or its respective suppliers make no representations about the suitability of the information, products, and services contained on this web site for any purpose. All such information is provided "AS-IS" without warranty of any kind. Auto World USA, Inc and/or its respective suppliers herby disclaim all warranties and conditions with regard to this information, including all implied warranties and conditions of merchantability, fitness for a particular purpose, title and non-infringement. In no event shall Auto World USA, Inc and/or its suppliers be liable for any direct, indirect, punitive, incidental, special or consequential damages arising out of or in any connected with the use of this web site or with any delay or inability to use this web site, or for any information obtained through this web site, or otherwise arising out of the use of this web site, whether based on contract, tort, strict liability or otherwise , even if Auto World USA, Inc or any of its suppliers has been advised of the possibility of damages. Because some states/ jurisdictions do not allow the exclusion or limitation of liability for consequential or incidental damages. The above limitation may not apply to you. Online Bidders are entering into a legal and binding contract to purchase the vehicle described above. If you do not intend to purchase this item, DO NOT BID! Unqualified Bidding, Unqualified Bidders, Auction Interference, Shill Bidding, or any form of harassment can be subject to legal prosecution. We reserve the right to cancel bids at anytime for any reasonable reason. Ad created by eCarList.com. Call 214-722-8200 to find out how eCarList can service your dealership. 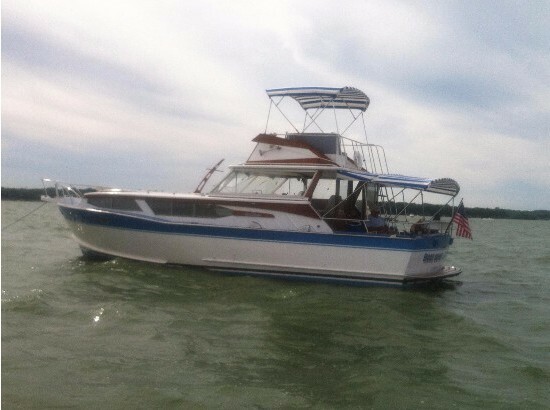 BOAT OWNER'S NOTES for 1973 PACEMAKER Motoryacht with Flybridge, Call Boat Owner Brent @ 419-535-3500 or 419-460-8220. 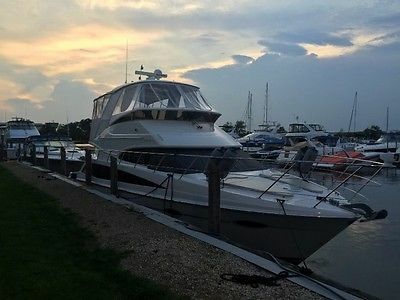 Description: Classic 1973 PACEMAKER Motoryacht with Fly Bridge. ENGINE & TRANSMISSION:CRUSADER Chevy 454 with 330hp, completely rebuilt engine in 2009, starboard transmission rebuilt in 2009 as well. FEATURES & EQUIPMENT: Has 3 air conditioners, sleeps 6, 2 heads with shower, storage, Jensen stereo system w/CD & USB NEW in 2009, swim platform. MISCELLANEOUS: 2 anchors, Coast Guard pack, 2 bilge pumps, carpet, compass, dockside power, dual batteries, VHF, professionally maintained. GALLEY: Fully equipped with sink, refrigerator/freezer, microwave. SPECIAL NOTE: This boat has always been in fresh water and is ready to go. A lot of boat for the $!!! 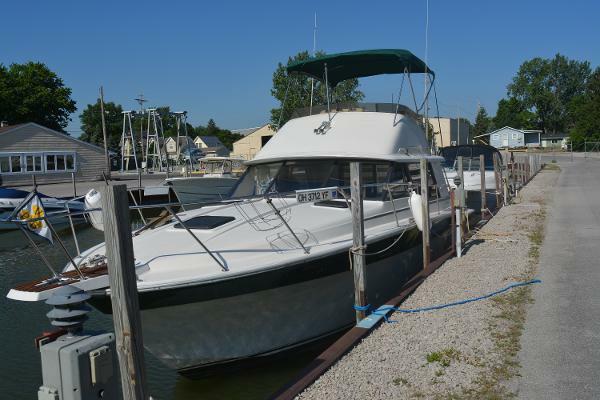 If you have any questions about my boat call me @ 419-535-3500 or 419-460-8220.